Q: Why is this a good time of year for pharmacists to focus on supplement sales? A: Any time after January is great because this is when patients tend to leave the deductible phase. At this point, insurance kicks in, which means they have lower copays and likely more disposable income. At Iuka, we like to focus on one area, such as nutrient depletion, for a full three-month period so we cover patients with 90-day supplies. We also leave a comment in our system to let all our staff know that we talked to a patient and what day it happened. This way, we don’t ask a patient about the same product for six months and it holds the team accountable. Q: How do you tackle DIRs along with supplement sales? A: The number one reason patients discontinue a drug they start is still side effects. If Amplicare pops up a DIR notification, we look at compliance on that patient, immediately ask them if they are having any side effects and educate them on the ability to offset short- and long-term side effects. Q: What is your standard workflow for engaging patients affected by nutrient depletion? A: Our goal is to ask every patient taking a medication that will cause depletion once about every six to nine months. We will not ask sooner than six months and usually refocus on a specific area every nine months. We also always educate on any new prescriptions. In both cases, we use Amplicare to assist us in identifying the opportunities. Q: You recently started carrying CBD products at your pharmacy. What has the patient response been so far? A: Fantastic. We’ve gotten tons of positive feedback, incredible results, and repeat sales. We’re also very excited about Amplicare’s new CBD report and plan to use it to fight the opioid crisis by offering our opioid and benzodiazepine patients another alternative. We’ve already had an awesome patient success story where a doctor had lowered a patient’s hydrocodone dose, and the patient was having a lot of trouble. We offered CBD. The doctor called us back a few days later and thanked us and said the patient was really responding well. Now that doctor send us patients for CBD oils. We use the CBD pop ups from Amplicare to help us identify other patients that we can offer the product to. We tend to print the paper with patient’s name on it and use that to start the conversation and educate the patient on how CBD can help them. The process is easy for our team to implement because it is nearly identical to the drug nutrient depletion processes we already use in Amplicare. Drug nutrient depletion and CBD are actually great examples of two different markets for us. We’ll focus on one market, say drug nutrient depletion, for a set period of time, say February, March, and April. Then, we’ll switch to CBD in May, June, and July, focus on another market in September, and so on. Obviously anytime we hear from a patient with a particular problem, we offer the product they need no matter what market we are focused on for that quarter. 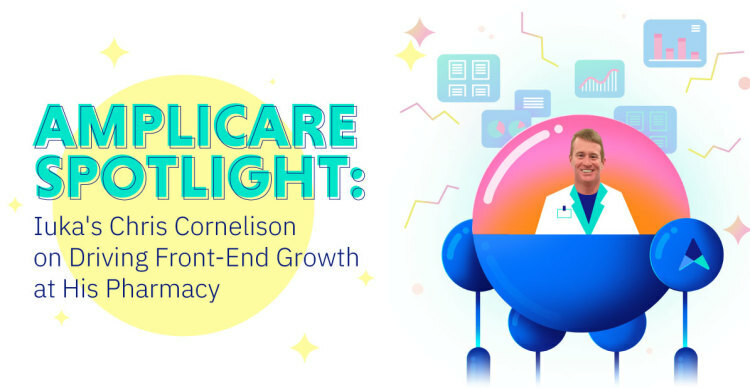 Q: What new products are you seeing driving front-end growth for pharmacies? A: High-quality Omega like our new Superior Omega with 2400mg total Omegas per serving. Also, probiotics (we carry Probiotic/prebiotic combination Superior Probiotic), pharmaceutical-grade multivitamins (Solutions Rx Superior Men and Women multivitamin), and some other as-needed products like joint relief (Superior Joint), leg cramp relief (LC 655), and sleep formulas (Superior Sleep). For more information on how you can tap into alternate sources of revenue for your pharmacy, register for our “Diversify Pharmacy Revenue” webinar.